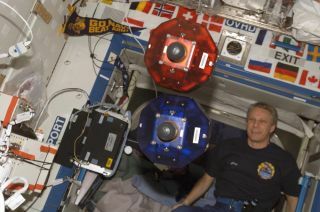 ESA astronaut Thomas Reiter with the Spheres robots on the ISS. Two basketball-size robots gave off puffs of compressed gas as they flew around inside the International Space Station to simulate the mining of virtual asteroids. Their success or failure depended completely upon computer coding provided by student teams watching from 250 miles below on Earth. Two hundred high school students gathered at MIT to compete in the third annual Zero Robotics SPHERES Challenge held Monday, Jan. 23. They watched a live video feed of astronauts Don Pettit and Andre Kuipers commanding the robots to follow each team's algorithms — tests that could lead to better software for tomorrow's spacecraft docking operations or space robot assistants. quite a feat, but to have that ability, talent and discipline at such a young age is remarkable. Our future is in good hands." Students had to program the robots to perform certain maneuvers that mimicked docking, formation flying or retrieving objects. Pettit and Kuipers acted as astronaut referees, and occasionally scrambled to "refuel" the robots by digging into the space station's extra tanks of carbon dioxide. The contest took on heightened intensity when a glitch brought down the video connection during the championship round. But Pettit saved the day by stepping in to narrate the robotic maneuvers over the live audio feed. Students from 38 schools across the country gathered at MIT for the 2011 Zero Robotics challenge. "They're stabilizing at 50 centimeters (nearly 20 inches) and closing," Pettit announced to the MIT crowd. "Are they going to crash? They just missed each other! It looks like they've completed … and we have a score!" Teams from high schools in Maryland, New Jersey and Florida claimed first place in the U.S. competition under the collective name of "Alliance Rocket." The European winning teams, called "Alliance CyberAvo," hailed from Turin, in Italy, and Berlin. The contest was sponsored by NASA and the U.S. military's DARPA research arm — both agencies with a strong interest in boosting the onboard intelligence of satellites, spacecraft and robots. Astronauts Don Pettit (left) and André Kuipers (right) watch as two SPHERES robots perform their operations as part of the SPHERES Zero-Robotics tournament. For now, the space station robots — called SPHERES robots — spend their time acting as floating video cameras or practicing spacecraft maneuvers. They could also serve as extra eyes to help the space station crew perform dull but necessary inventory or environmental surveys.